Tapping into the power of Exacq’s enterprise level video security features just got a whole lot easier with the launch of the new EM-Series hardware platform dedicated to running Enterprise Manager software, which is now an integrated part of the exacqVision Enterprise edition VMS. Through an intuitive dashboard, the Enterprise Manager provides ready access to enhanced health monitoring, user management, administration of software updates, high-availability capabilities and much more. 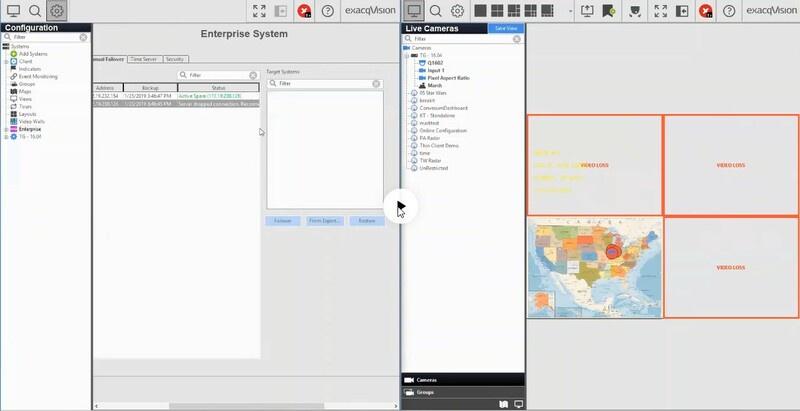 The powerful combination of EM-Series servers running Enterprise Manager simplifies management of exacqVision VMS software and provides customers with the features that are indispensable in distributed enterprise environments. Large enterprises often have complex organizational memberships – employees who work in various departments, contractors who shift between jobs, etc. Enterprise Manager streamlines the administrative process by letting you define logical groups and associate users and NVRs to those groups. Administrators can now define how organizational groups are related to one another in hierarchies. This allows them to quickly assign NVRs and users to a group and its sub-groups, while also providing the ability to configure exceptions to group memberships that will cascade throughout the hierarchy to ensure consistency across the enterprise. 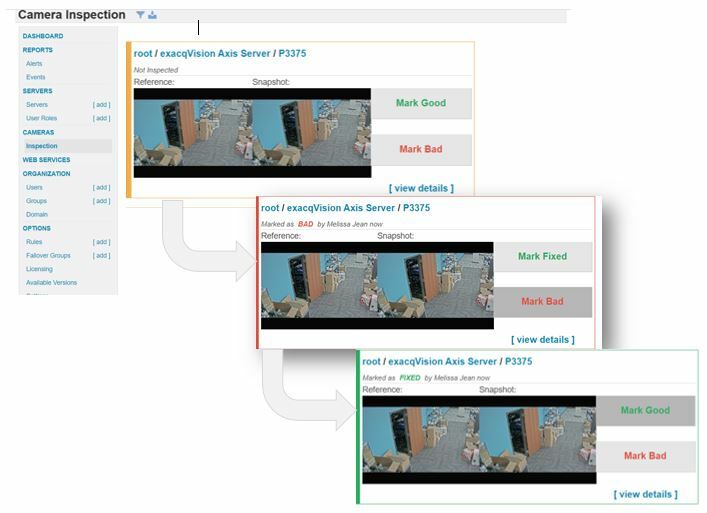 From a single screen, an administrator can leverage dynamic filtering of camera names to define users’ roles to specific cameras that span multiple NVRs. For enterprises with dozens or hundreds of NVRs, this saves a significant amount of time over navigating to each individual NVR to define the specific camera restrictions. 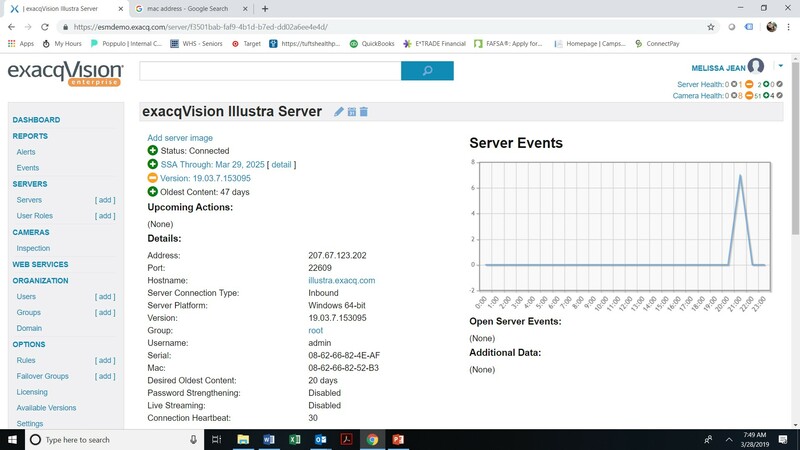 Enterprise Manager dashboards shows healthy, warning and error status for all cameras and NVRs at-a-glance, to ensure the fastest response to service issues and avoid down time. Detailed reports that show graphs of event trends, SSA status, network identification, and overall system health help security teams more quickly identify NVRs or cameras in need of service. Quickly and easily set up natural language notification rules for any of 30+ events on specific cameras or NVRs for individual people or groups. 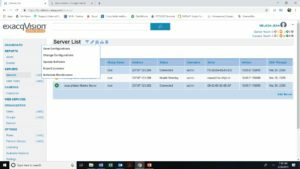 From one screen, Enterprise Manager lets you easily create these event links and email profiles, and provides “lasts at least…” rules to ensure noisy systems do not generate too many events. 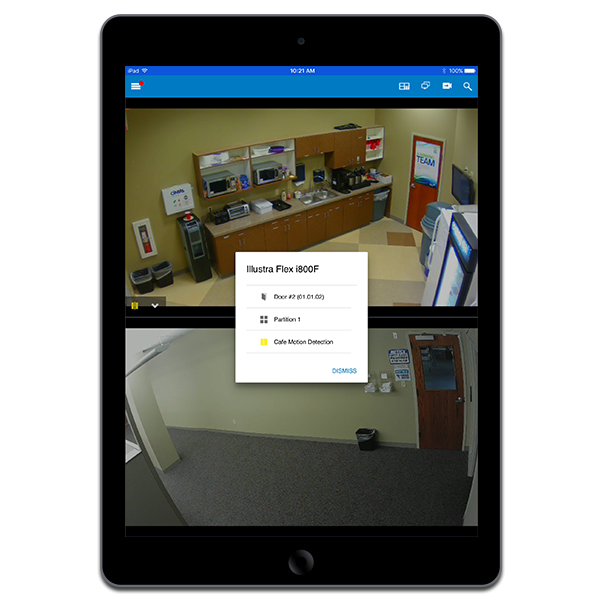 Enterprise Manager eliminates the manual process of granting camera access to a user who has been given permissions on a new NVR. By dynamically leveraging the user’s global credentials, Enterprise Manager provides faster connectivity to NVRs. To increase security and compliance, more businesses are using single sign-on throughout their enterprise. Enterprise Manager helps perpetuate this by dynamically authenticating domain credentials via single sign-on for the client, eliminating the need for users to type in usernames and passwords. Enterprise Manager can capture reference images for every camera and provide review workflows to compare the current scene to the reference scene. Scenes that don’t meet the quality of the reference image can be marked for technician follow-up. Easily filter reviews by last review date, camera name and other criteria to help segment image reviews of large environments. The Enterprise Manager supports manual and scheduled backup of NVR configurations to enable faster recovery of security operations and improve safety. Once backed up, configuration files can be restored if unwanted configuration changes are made. With multiple backups, recovery from un-intended configuration changes is also possible. Admins can also use Enterprise Manager to easily schedule software updates across the environment – either caching the update for NVRs to pull from, or having the NVRs pull directly from exacq.com. Enterprise Manager can also push notifications to clients to prompt users to update their client version to ensure they have the very latest enhancements and fixes to ensure optimal operation. 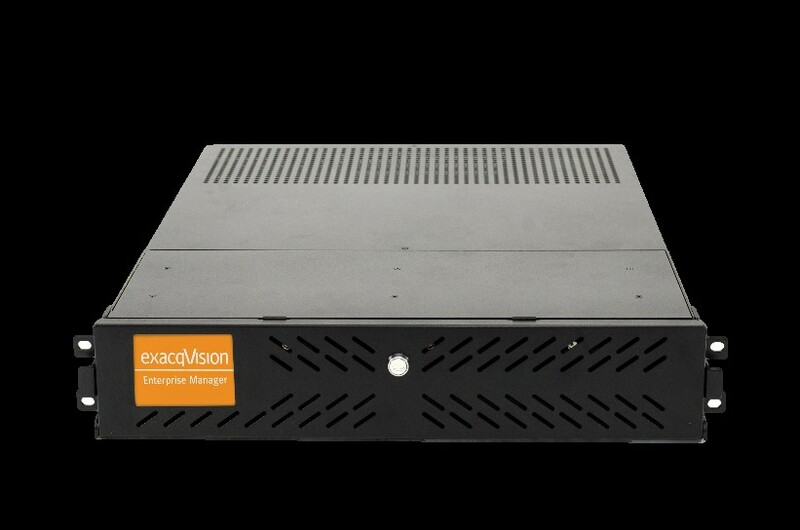 exacqVision EM-Series servers were specifically designed and qualified to run the Enterprise Manager software, which is pre-loaded and configured to ensure a smooth and hassle-free user experience. 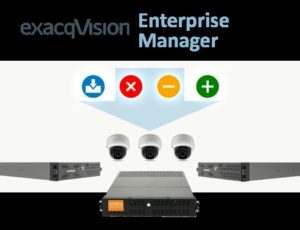 The exacqVision EM-Series servers offer large-scale deployments a robust, performant platform to monitor and manage up to 2,000 exacqVision Enterprise recorders. Losing data on a video security system can be frustrating and costly. 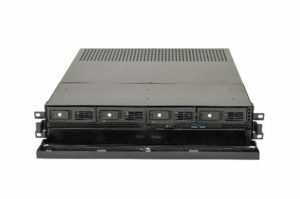 The EM-Series is an enterprise-class server complete with RAID 6, redundant power supply, and front-loading hard disk drives that make it easy to service. EM-Series servers ship with Windows Server 2016 or Ubuntu Linux 18.04 to satisfy the technology, security and compliance requirements of an enterprise IT department. exacqVision EM-Series have been designed to be resilient against cyber-threats. This solution includes role based access control that allows administrators to restrict access to functions by user role. Safeguard controls include an enhanced security mode which forces the use of complex, non-default passwords and encrypted communications. EM Series adheres to the rigorous standards of the Tyco Cyber Protection Product Security Program. The holistic approach to cyber protection is aimed at providing peace of mind to our customers. Our security mindset begins at initial design concept and is supported through deployment, including a rapid incident response to meet the comprehensive and evolving cybersecurity environments. 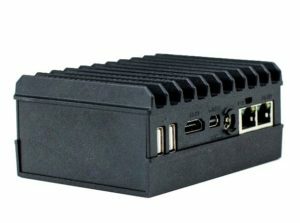 The new exacqVision G-Series Micro NVR is a cost-effective video recording solution designed for customers who want to leverage the enhanced accessibility and reliability of cloud video storage with low upfront costs. The G-Series Micro NVR supports the redundancy and higher security that cloud storage provides, including bookmarks and alarm-based recording, with low upfront costs and without requiring a sophisticated IT department. 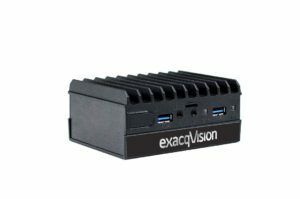 A compact ‘gateway’ to the cloud, exacqVision G-Series Micro NVR supports the newly released exacqVision Cloud Drive storage, giving customers an economical option to store, access, and search critical surveillance video in the cloud from up to eight IP cameras. The G-Series Micro NVR is compact and can be easily mounted to a wall or in any covert location using the optional VESA mount, ideal for space-constrained applications such as retail shops, restaurants, banks, and other professional offices. The system’s fan-less convection cooling offers quiet, failure-resistant operation, and is ruggedized to handle environmental factors such as high temperatures and dust, making it ideal for businesses demanding zero disruption to operations. Typically, our lower cost exacqVision value line recorders come with exacqVision Start licenses. However, because the G-Series Micro NVR was designed to support exacqVision Cloud Drive storage, it includes exacqVision Professional VMS software and two free professional IP camera licenses. As with all exacqVision recorders, the G-Series Micro NVR includes a 3-year hardware warranty and 3 years of unlimited software updates to ensure your system is current with all the latest features and functionality. exacqVision G-Series Network Video Recorders (NVR) have been designed to be resilient against cyber-threats. This solution includes role based access control that allows administrators to restrict access to functions and cameras by user role. Safeguard controls include an enhanced security mode which forces the use of complex, non-default passwords and encrypted communications. G-Series NVRs adheres to the rigorous standards of the Tyco Cyber Protection Product Security Program. The holistic approach to cyber protection is aimed at providing peace of mind to our customers. Our security mindset begins at initial design concept and is supported through deployment, including a rapid incident response to meet the comprehensive and evolving cybersecurity environments. 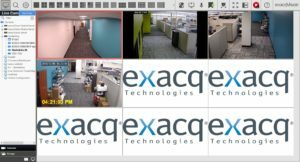 exacqVision v19.03 is the latest version of the popular VMS software known for its intuitive feature set and simple configuration and maintenance. The features introduced in this latest version provide users with greater flexibility and freedom for business-optimizing results. Enterprise users can now more quickly navigate multiple maps of their facility – easily linking parent maps, child maps to parent maps, and vice versa. This provides much-needed control and oversight to security operators who need to respond quickly to security events, no matter where they occur. 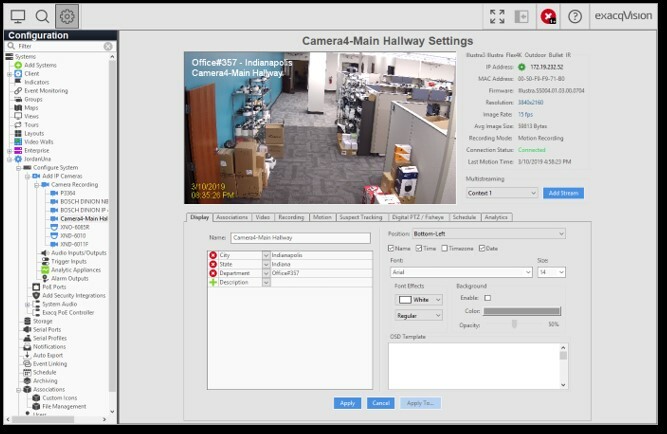 exacqVision users can now customize their cameras’ on-screen display (OSD) to show useful information such as city, state, asset tag or a custom description of the camera. 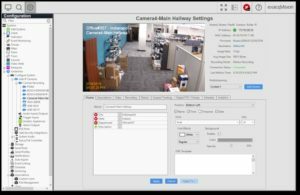 This can save costly time spent searching for cameras that need maintenance, as well as help identify precisely which camera may have recorded critical video. Messages can be displayed on multiple lines in various font colors and text styles to help indicate levels of urgency or categories of information. In the event of a server failover, the exacqVision Client saves the user’s Live settings and dynamically switches live video from the failed primary server to the spare server. This includes video and audio, serial data, Maps, Groups, Views, and Event Monitoring profiles. Enterprise customers can set up automatic failover with an Enterprise Manager license and a properly licensed spare server, or they can set up manual failover with just an Enterprise license. This release also adds faster detection of NVR failure with Enterprise Manager, signficantly cutting the detection time from 30-240 seconds to 5-20 seconds. As the demand grows for faster incident responses in more cost-effective ways, security and IT teams are seeking solutions that provide the ultimate flexibility and accessibility without the exorbitant price tag. exacqVision 9.8 supports several new enhancements that will improve users’ ability to store, analyze and search for video. 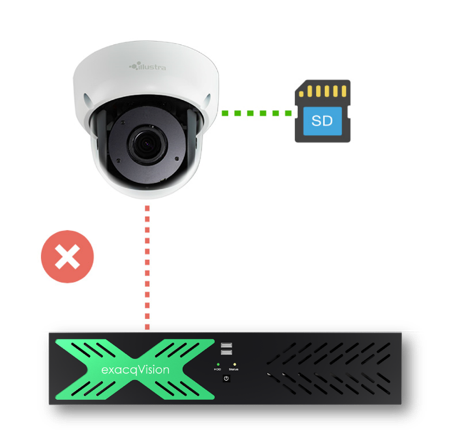 Most notably, exacqVision now supports the exacqVision Cloud Drive storage, a subscription-based solution which will provide an easy way to store, access, and search critical surveillance video in the cloud. exacqVision 9.8 supports the newly introduced exacqVision Cloud Drive storage, a new way for users to easily store, access, and search critical surveillance video in the cloud. This solution allows customers to store an offsite copy of video as a safeguard against natural disasters, theft and other events, all while reducing capital expenses and increasing accessibility. exacqVision Cloud Drive storage helps security and IT teams lower their Total Cost of Ownership by eliminating some of the unnecessary hardware costs and management of storage infrastructure. Many Exacq customers leverage Axis Perimeter Defender analytics as part of their video management solution. 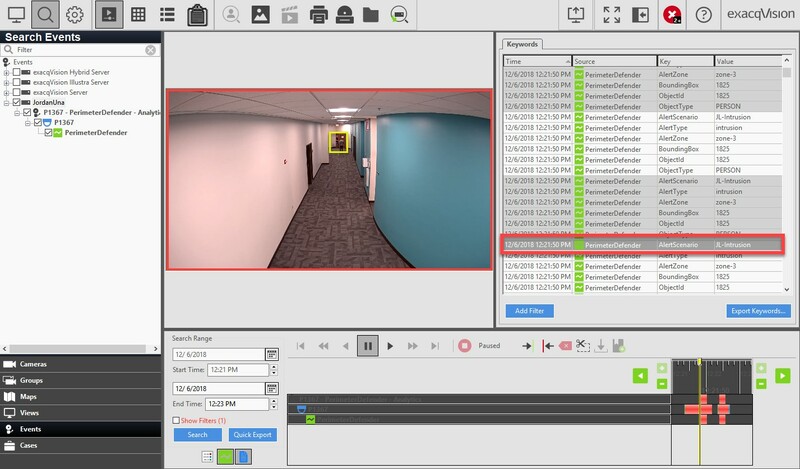 The latest exacqVision release helps to strengthen the forensic analysis of essential video by allowing customers to display those analytics – including bounding boxes, object trails, and object overlays – in live video and video searches. Administrators can now better monitor server activity by logging more detailed system information, such as which segments of a recorded video clip were watched and by whom, and then export that information in a variety of report formats. 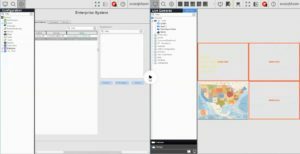 When creating layouts from a particular Group or View, users can now enable or disable auto-populating of cameras in the exacqVision Client. The ability to enable or disable this auto-populate feature gives users ultimate control over which cameras make up their layouts without disrupting those from other Groups or Views. 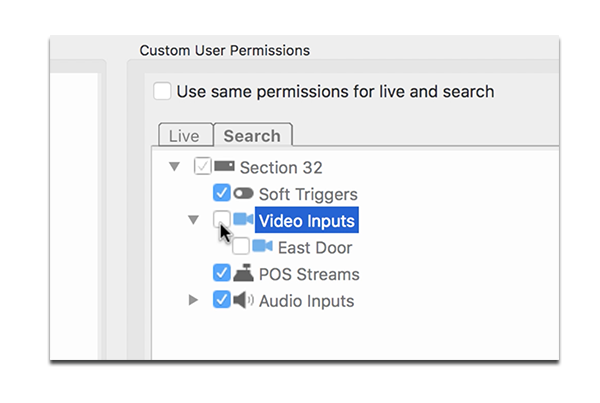 Administrators can now assign highly customized device level permissions – whether video, audio, serial, or soft triggers – for specific user groups in ESM. For example, an administrator can grant ‘Live Only’ permissions for certain cameras, without allowing search capabilities. Setting device permissions is extremely intuitive with the list of devices grouped by NVR. NVR groupings of cameras are collapsible and expandable for fast configuration, allowing administrators to quickly and easily find and select specific cameras by name across all NVRs. Camera inspection inside ESM is much more intuitive, now requiring zero setup to receive video streams. Enable live video viewing without complex steps such as setting up and configuring web services. With this release, ESM can natively display video from cameras, making it a breeze to perform camera inspection. The use of video surveillance to detect, deter and prosecute crime has grown significantly, and increases in camera resolutions and frame rates have caused the need for video storage to surge at an unprecedented rate. 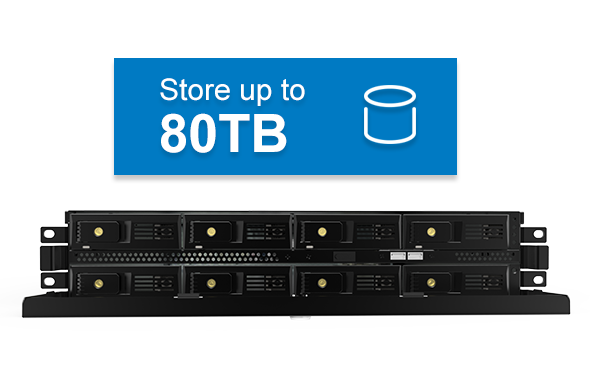 Exacq’s new line of high-capacity, front-accessible hard disk drives (HDD) within its exacqVision A-Series recorder portfolio answers those extraordinary demands for video storage expansion. The new network video recorders let you spend more time on investigations and value-added services to your business, and less time managing your system. The new front-accessible recorders are the first models with HDD configuration designed to address future storage needs. 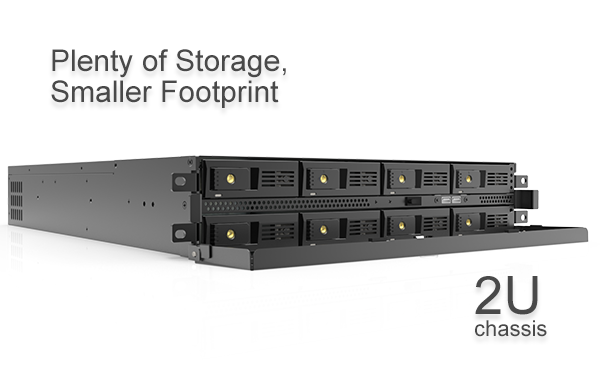 Their flexible configuration makes it easy to simply shut down the system and insert additional hard drives from the front of the chassis for hassle-free maintenance and expansion. 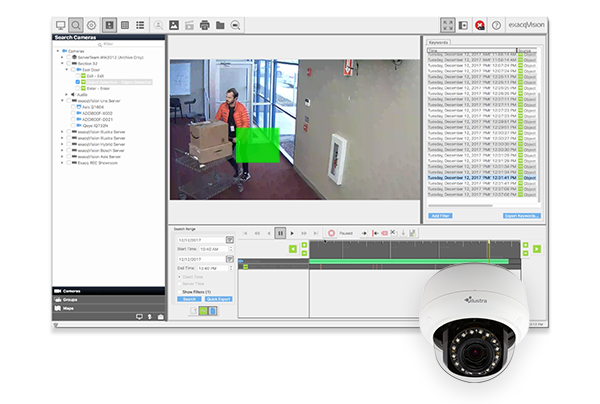 Featuring hybrid and IP server models, the front-accessible A-Series recorders include 4 IP camera licenses, support up to 64 IP and 32 analog cameras, and are compatible with thousands of IP camera models from leading manufacturers like Illustra, Axis, Arecont and more. Like all Exacq recorders, the new models include a 3-year warranty and 3-year SSA for all cameras on the system. The front-accessible recorders are smaller than a 4U system, providing a streamlined, sleek solution that saves rack space while giving you comparable storage expansion for future-proof surveillance operation. As part of the A-Series family of recorders, the new front-accessible recorders feature the same high-performance, feature-rich reliability. They can continuously record up to 550 Mbps of video for high concentration of high-definition analog and IP cameras, and can stream up to 1,800 frames per second of live/recorded video to web/mobile clients. Available with either Windows 10 or Ubuntu 16.04 operating systems, the new models of the exacqVision A-Series IP and Hybrid Recorders offer Quad NICs and RAID 5, making them ideal for enterprise environments needing expansion and reliability assurance. Easy-to-use, easy-to-install. exacqVision has owned that mindset for decades, and version 9.2 continues driving forward with innovative features that let customers configure and customize the system exactly the way that works best for them while providing strong security features to protect against cyber-attacks. 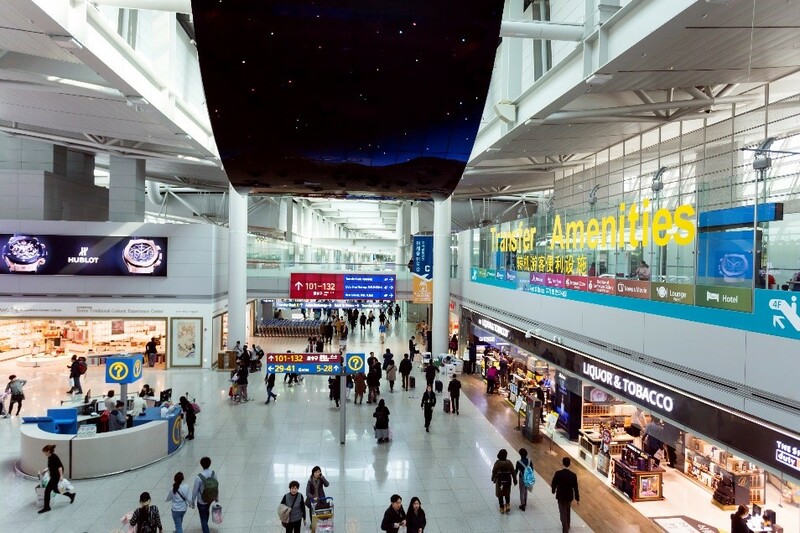 A video wall provides a powerful way to improve incident awareness and reaction time. When operators can configure video wall layouts in a way that works best for them, it stands to reason that they will respond to incidents more quickly. 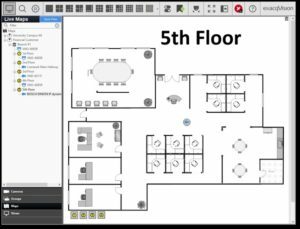 The latest exacqVision release empowers users to create a fully customized layout with a simple click and drag of a mouse, even re-sizing the layout to perfect the view. Create a command and control center by pushing your customized video wall or multiple video walls to an array of monitors. In a quickly developing situation, collaboration is often the key to fast and safe resolution. 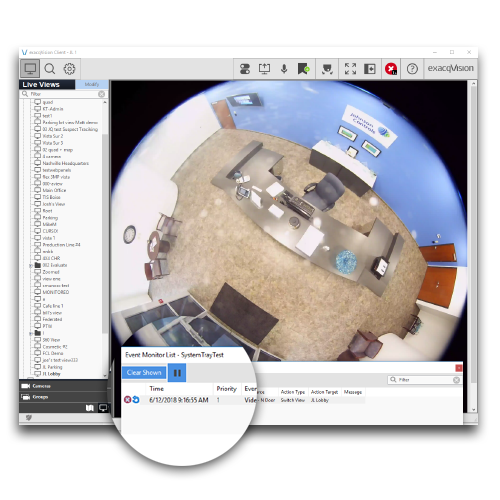 Enhancements to exacqVision’s VideoPush feature let operators quickly conduct investigations and then send, or “push”, that video to another user’s screen or spot monitor with the click of the mouse. This instant sharing of video search results can save critical seconds when every guard location needs to be aware of who or what they are looking for. Information that is delivered in a meaningful way is the best way to ensure a fast response. In v9.2, users can now upload their own custom icons for video overlay status or to show controls for cameras and other third-party integrations. For example, a dollar sign icon could be used with a POS integration to indicate a transaction over a certain dollar amount, or a “No Entry” icon could be used to indicate when an object has crossed into a restricted area. These cues are critical for operators who spend hours viewing video and need to quickly understand and react to real-time information. 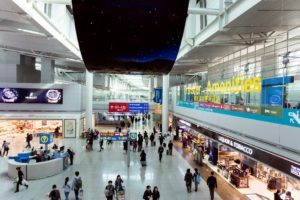 Two-way audio is an important and convenient way to ensure security in many applications; for example, a receptionist communicating with guests through an intercom, or a security officer providing instructions to employees trying to access unauthorized areas. 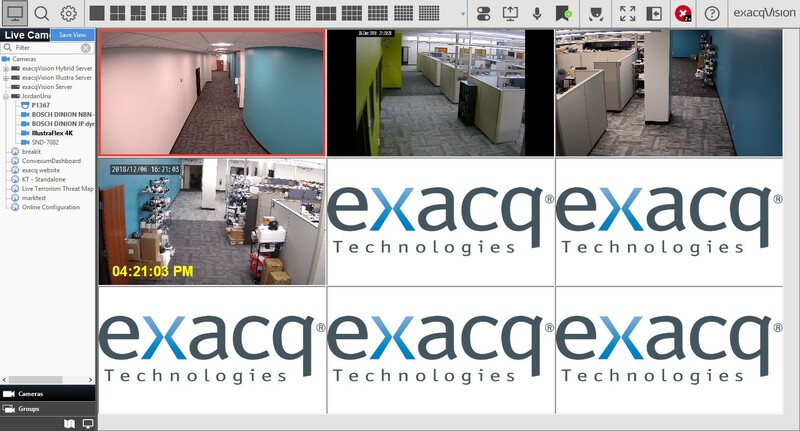 exacqVision now supports inbound audio from cameras, intercoms, and other integrations through Event Monitoring, making two-way audio simple to set up. Camera not recording? Now you’ll know. In small installations, it’s fairly easy to see that all cameras are recording as they should. However, when your installation includes hundreds of cameras across multiple servers, it is more complex. 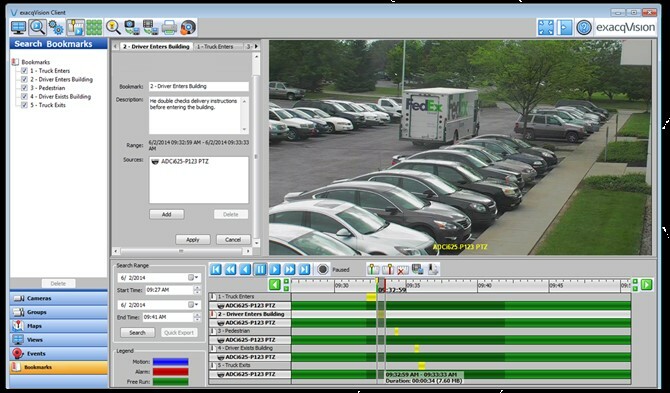 exacqVision 9.2 solves this problem by allowing users to easily configure alarms for a camera that isn’t recording. For example, a user can set an email notification to be sent whenever a particular camera has gone ten minutes without recording video. This allows security to avoid costly business disruption by proactively resolving configuration issues to ensure all video is being recorded as expected. Cybersecurity best practices dictate that passwords should never be shared, and that certainly applies to the video management system. 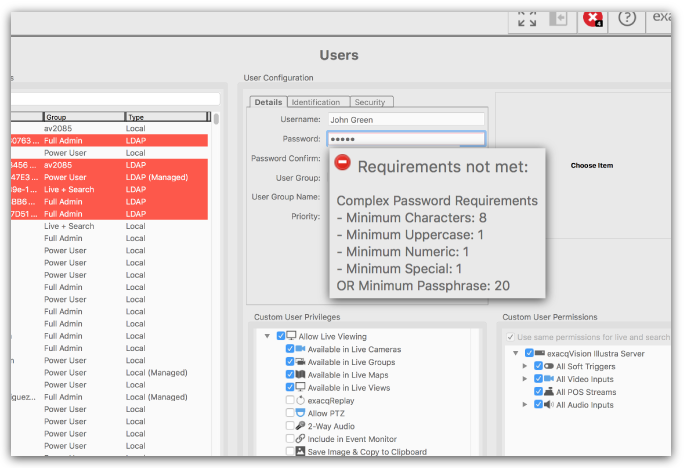 exacqVision 9.2 now puts the password responsibility where it belongs; administrators can either permit users to change their passwords whenever they want, or require that users change passwords after a defined amount of time. Available for all servers that have enabled enhanced password strengthening, either option prevents the administrator from discovering the user’s password. When a user is denied access and not provided a clear reason, it can be frustrating. For exacqVision users on a restricted access schedule, the generic “invalid login” message they would receive was particularly trying. 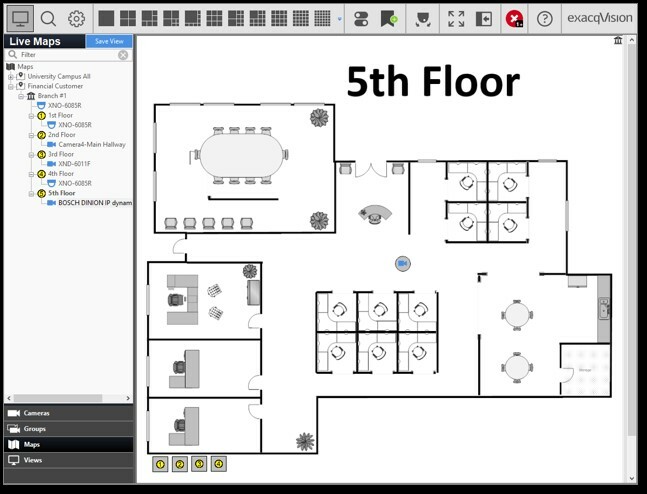 Always focused on the user, exacqVision 9.2 significantly improves that experience. Now, the exacqVision client will tell the user their login failed due to a user schedule if they attempted to log in outside of their schedule. The client will then attempt to connect every minute until the user’s scheduled start time, making the login process much more intuitive. Another cybersecurity best practice is to require users to choose passwords which contain a number, capital letter, and a symbol. While this is a great way to protect user credentials, remembering these complex passwords can be a challenge. 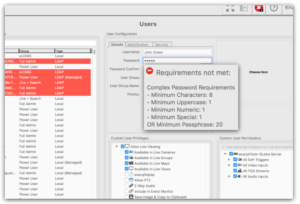 With exacqVision 9.2, users can now choose to create a longer passphrase (e.g. RedJeepsAreBest!) instead of a shorter complex password (e.g. Uvv*147!xy). These longer passphrases tend to be easier to remember and make the login experience more intuitive, while still keeping credentials safe. It can be a challenge for administrators to ensure all exacqVision users are using the most updated software versions. exacqVision 9.2 simplifies this process by adding the client version to the System Information page for each user on a server. Now, administrators can save time by checking for outdated software by simply scanning a list of users for each server. As part of our continued focus on cybersecurity, exacqVision 9.2 introduces security enhancements to the Exacq mobile app and web client. These include disabling autocomplete in forms and the option to factory reset the web service, which clears all generated keys and database information. Any time a form autocompletes with information that’s already been entered (usernames, IP addresses, etc. ), it makes a potential hacker’s job easier. Wiping information such as IP addresses and user names adds an extra layer of protection and makes it very difficult for hackers and unauthorized users to steal critical information and access company systems. 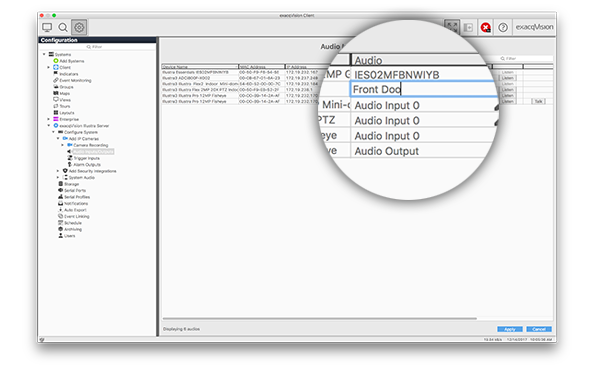 To save bandwidth, exacqVision 9.2 now provides the option to timeout video panels when the web client or mobile app hasn’t been interacted with for a specified amount of time. This can save significant network bandwidth, and also ensures your devices are secured when they are not actively being used. Using Exacq Mobile to view live and recorded video from up to 48 cameras on your mobile device can be a huge productivity saver. Using a mobile device as an extra display at your work station can add to your overall awareness and allow you to take Exacq with you when investigating an incident. However, when the device “goes to sleep” because you haven’t interacted with it, those lost moments of surveillance can leave you feeling a bit vulnerable. The latest release of Exacq Mobile allows you to continuously play video from your mobile device without having to periodically interact with it to prevent it from sleeping. In addition, the redesigned Views page makes the experience much more intuitive for mobile users. Available views are now fully displayed on the screen instead of organized in nested menus, and layout diagrams have been added to allow users to quickly identify the right view. In addition, a full list of a view’s included cameras can be displayed by a simple long press, making it easy to identify appropriate cameras. Enterprise System Manager (ESM) helps to maximize the uptime of exacqVision Enterprise recorders. Its intuitive health monitoring dashboard provides continuous system health information, and immediately notifies you of system errors and warnings such as camera disconnected or video loss. The newest release of ESM adds critical notifications if a camera unexpectedly stops recording video because the camera’s motion configuration was altered, the recording schedule was modified, or other similar scenarios. ESM provides a rules-based interface to set up alerts and email notifications if a camera has not been recording for a specified duration. 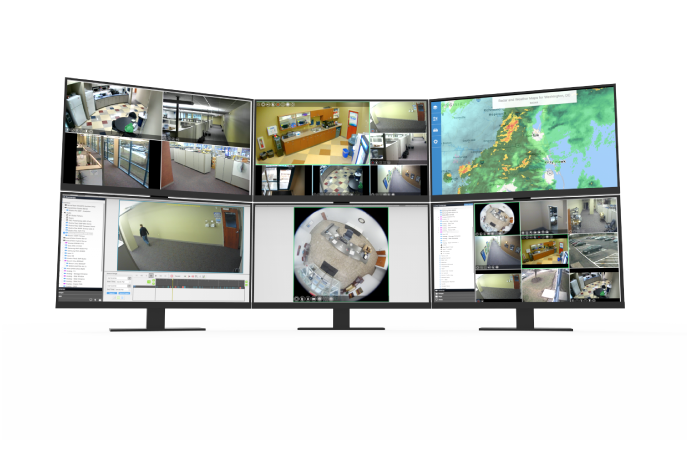 These alerts allow an integrator to proactively address camera configuration issues before they become a problem. 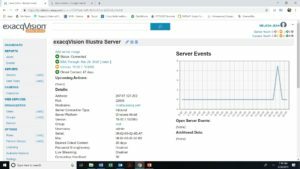 Sometimes reverting to a working configuration of an exacqVision Server is a quick and safe way to get a customer’s system functioning again. The latest release of ESM provides an intuitive and flexible way to set up and schedule configuration backups. The flexible scheduling feature allows for daily, weekly and monthly backups which not only helps with fixing broken systems, but provides peace of mind to administrators when making configuration changes in ESM. ESM has always supported email notifications by allowing the administrator to set up the email configuration with individual addresses. However, there was no way to validate whether those addresses were correct. With the latest release of ESM, email addresses can be quickly verified with the click of a mouse. Intrusion panels are a key security ingredient for many customers, and ensuring they are always operational is critical to providing a secure environment. 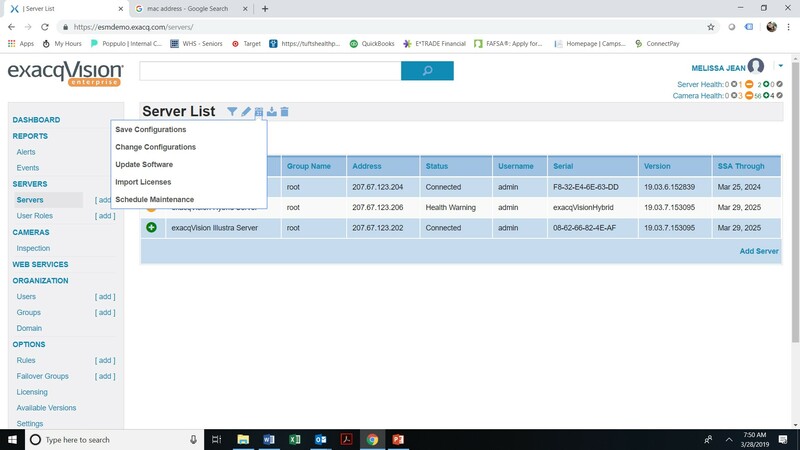 The latest version of ESM allows users to configure rules based on important health data from intrusion panels, such as “low battery”, to proactively identify and fix issues before they affect security. ESM and exacqCloud can now be used to easily turn on the enhanced password security feature that was introduced in exacqVision 9.0 for multiple servers. This feature helps protect users from “man-in-the-middle” and “client masquerading” attacks through the use of key strengthening and augmented password authentication.